Pelikan has had many unique fountain pen releases over its long and storied history. Amongst the Classic line, the marbled variants have proven very popular and have had an enduring presence since their introduction in the late 1980s. Perhaps no finish has enjoyed the longevity of the grün marmoriert or green marbled variant, one of Pelikan’s best sellers. This pattern has seen no less than five permutations across a couple of different models in the M2xx family. 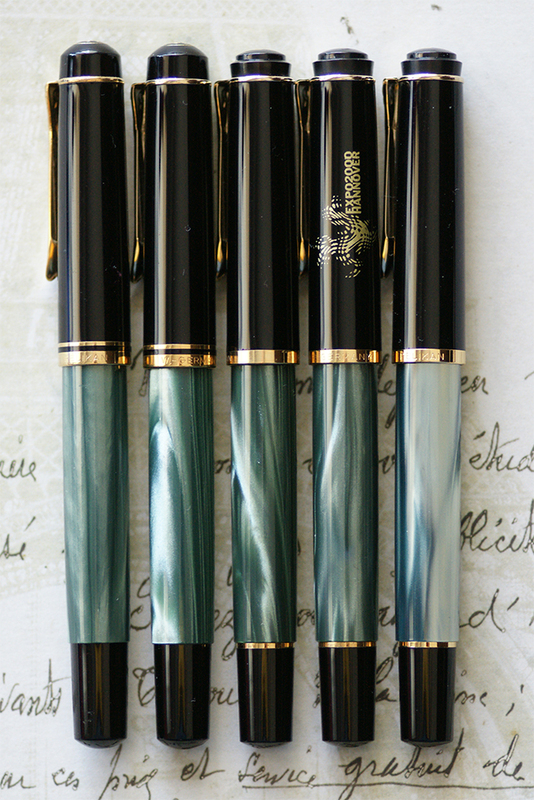 The marbled look can be traced all the way back to Pelikan’s earliest pens dating to the 1930s. I thought that it would be fun to explore each one of these modern iterations in the M2xx line-up, especially in light of the newest version released in November 2015. Green marble is back and while it may seem like much of the same on the surface, there are some subtle differences that are worth pointing out. This is the original M200 green marbled fountain pen released in March of 1988 alongside the similarly styled grey and blue marbled models. These are found in Pelikan’s older, pre-’97 trim style which can be distinguished by the derby cap top and double cap bands. It features Pelikan’s traditional beak clip along with a light anthracite colored ink window. The cap band will have either “W. Germany” or “Germany” engraved depending on whether production preceded or followed the years 1990/91. The nib is gold-plated stainless steel and was available in both standard and oblique options. The barrel itself is made of varying shades of green to give it that marbled appearance. Each pen has a somewhat unique pattern when laid side by side. 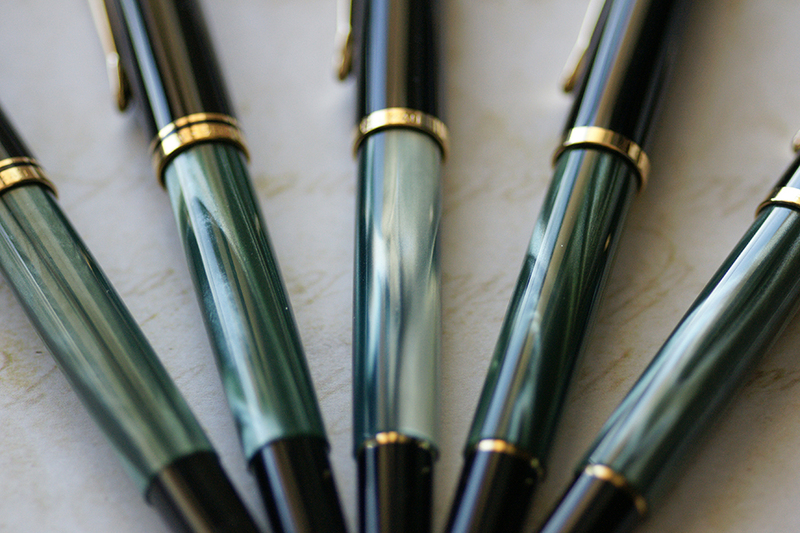 Pelikan re-styled many of the pens across their Souverän and Classic lines in 1997 which gave us the M200 green marbled in the new style trim. Not all of Pelikan’s pens made the style transition but this marbled variant proved popular enough to make the cut. The barrel is fairly identical to the older style but the furniture and cap top have changed. We now have a crown cap top, single cap band, and a trim ring at the piston knob. The gold-plated stainless steel nib is again present and the ink view window remains a light anthracite color. 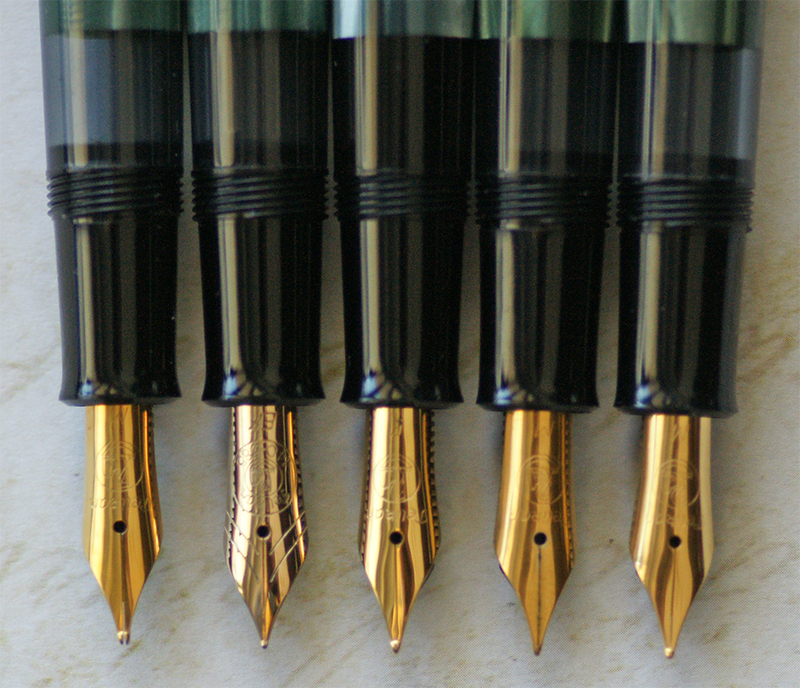 Oblique nib options were dropped later into this model’s run. This pen has had an intermittent availability on the market due to a reported difficulty sourcing the raw materials that comprise the barrel. These were very hard to come by circa 2010 before again being re-introduced in 2011 for a short period of time. A special edition green marbled M200 limited to a run of just 1000 pieces was made in the year 2000 by special order of Karstadt Warenhaus GmbH for Expo 2000, a World’s Fair held in Hannover, Germany. The fair ran from 6/1 through 10/31/2000 with the theme, “Man, Nature, Technology.” The pen made to commemorate the occasion is identical to the standard new style green marbled M200 discussed above with the exception of the cap which depicts the Expo 2000 logo. The M200 green marbled was re-issued as part of the standard collection in November of 2015 after having not been available for some time. The absence from the market was again likely due to difficulty sourcing the materials necessary to make the barrel. The new version has the same design as the original except a new, high quality acrylic material is employed in the construction of the barrel. This serves to give the pen a bit more depth and brilliance than the original versions. While that added brilliance is definitely noticeable, it would be difficult to distinguish between the variants without a direct side by side comparison. One tell-tale feature that may more readily help with a quick identification is that the ink window on this model is a much darker anthracite than what is found on any of the other releases. This model is identical to the old style M2oo outlined above with the exception of a 14C-585 monotone gold nib which was the hallmark of the M250 series. This was likely an export model that was made for the Japanese market sometime between 1988-1990/91. Most of the marbled M250 variants that I have seen are stamped “W. Germany” on the cap band. For further reading, please check out my article “Pelikan M200 Review and Comparison” featured on The Penman Post blog. I have a blue marbled variant. Derby cap, W. Germany, but a gold ring on the piston knob. That is a bit of a mis-match with an old-style cap (1985-1990) attached to a new-style barrel (1997-discontinuation). Still a wonderful looking pen. I like it. Has a nice OB nib too. Who knows, maybe the guy I bought it from switched caps, maybe they had been before he got it. I got it for a good price and it is in wonderful shape. I enjoy your site and your writing. Thank you for your comment and kind words Ron. Each pen will have a different feel owing to the size and weight differences so I do find some inherent differences when reaching for an M200 vs M600 vs M800. The nibs are a different story and older pens provide a much different (and better in my opinion) writing experience than the newer ones. Are they better writing instruments? No, just different. I enjoy the fact that there is such variety so that everyone may find the niche that suits them best. I received my M200 Green marble 2015 re-issue yesterday. I knew you said the new material gave it extra depth but even that didn’t prepare me. This marbled green is stunning! Yes, the coloring really is a nice upgrade over the original. Enjoy! I know this is a late comment, but I just now saw this article. I bought my first Pelikan in 1999, the M200 Green Marble. I checked, and it matches everything you say about the model that was issued in 1997. I’m learning a lot from reading your articles about the different Pelikan models. It’s gratifying to find “my” Pelikans among your articles and be able to identify the various features. Little did I know my Green Marble M200 would get me started in such an all-consuming hobby! I now have close to 20 Pelikans, some bought new, some second-hand. I really appreciate the detail you provide in your articles; it’s very helpful in identifying the features of the Pelikans I have collected so far. Never too late to comment. I’m always happy to know that people are reading the back catalog of posts. I’m glad to hear that you found the info helpful and can identify with some of the subject matter. It’s funny how innocent appearing your “gateway” Pelikan can appear. Then, before you know it, you’re neck deep in a flock.